CHICAGO (WLS) -- There's some new intrigue in the race for Illinois governor as the Chicago Bears ownership family has gotten involved, but the issue of money and taxes has now put the Trump factor into play for Democrats. As Gov. Rauner was on the second day of his "Our Home. 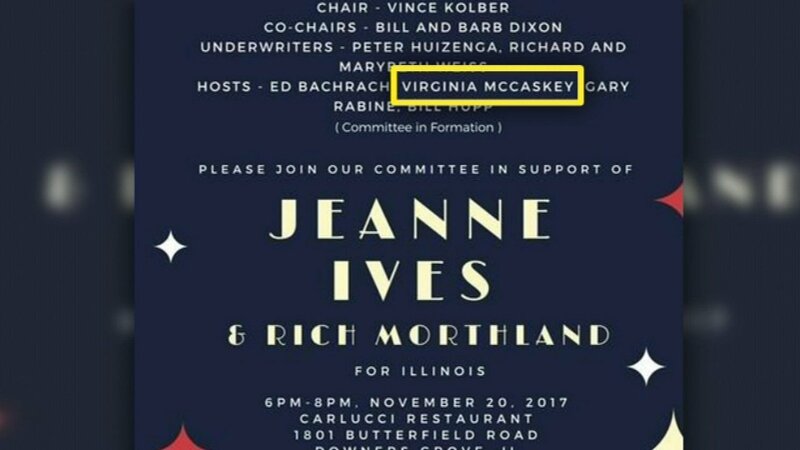 Our Fight" statewide tour, there was word that his potential primary opponent, State Representative Jeanne Ives has secured the support of Chicago Bears family matriarch Virginia McCaskey. In a flyer advertising a fundraiser next Monday, Ives lists McCaskey as a $10,000 table host. Democrats have tried to attack Gov. Bruce Rauner by connecting the Republican governor to President Donald Trump and that theme is part of the most recent digital ad released by JB Pritzker. But Pritzker found himself on the receiving end of the Trump tie-in, in a new digital ad by fellow democrat Daniel Biss questioning why Pritzker, like Trump, has not yet released his tax returns. "Seven months ago JB Pritzker said he would release his tax returns. It's been seven months I have no idea it would take so long, but what I'll say is he can end the criticism by releasing them tomorrow," said Democratic candidate for governor Daniel Biss. Pritzker's campaign said he will do so by the deadline to file nominating petitions, which is December 4. Pritzker also announced a new endorsement by the Northwestern Illinois Building Trades Association on Tuesday. It came as Lori Lightfoot, the head of the Chicago Police Board, announced her endorsement of Chris Kennedy. He has made an anti-violence plan part of his first TV ad campaign released Tuesday where he talked about the murder of his father Sen. Robert Kennedy. "We need to give people a choice between crime and a career and we're not doing that in the city and we're not doing that in the state. We're cutting off all of the programs that used to elevate people give them a ladder," said Democratic gubernatorial candidate Chris Kennedy. Of course, money is going to be a major factor in this race. The candidates need it to get on TV and boost their visibility. Right now, the ones with the most money, Rauner and Pritzker, have made good use of that resource.